This dirt bike is awsome! 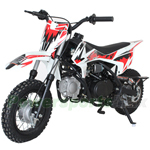 It is very sturdy and well made, It is vert easy to ride, My son is very thrilled with it. Also, the price is economical.